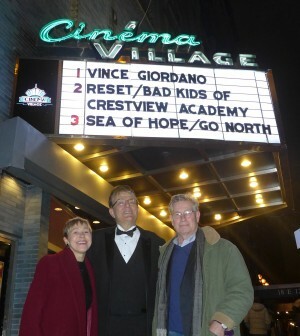 June, 2012 – we approached Vince Giordano and The Nighthawks about making a documentary. August, 2012 – our first shoot, at the Newport Jazz Festival. Sept 2012 – April 2014 – we keep shooting and start editing scenes for a demo, with seed money from some generous early supporters. May 2014 – Our Indiegogo crowdfunding campaign raises $82,544, enabling us to keep shooting and editing. August 2014 – April 2015 – while continuing to shoot new material, we edit the 2-hour rough cut down to 90 minutes. May 2015 – Post-production on the final cut. June 1, 2015 – we screen it for the first time to an invited audience. July 2015 – February 2016 – we start the music clearance process, which means more private screenings and more fundraising. The film cannot be released until music rights are paid for. March 5, 2016 – World Premiere at the Manchester International Film Festival. Dave, Amber, and Vince all travel to the UK for this, and the film wins Best Music Score. April – November 2016 – more public screenings and film festivals. We secure a distributor, First Run Features. Amber Edwards, Vince Giordano, and Dave Davidson at the NYC premiere. January 2017 – theatrical premiere in NYC, followed by screenings across the country. June 27, 2017 – release on iTunes. July 11, 2017 – release on DVD. RAVE REVIEWS, HELD OVER IN NYC, AND WESTWARD HO!